Two days in a row Lincolndemocrat has had over 1,100 visitors. This is better than three times the average of the summer which itself was up from the period before the school board filings opened. As I wrote two posts ago I am more inclined to put up lawnsigns at the moment than blog but I realize my original eight loyal readers like fresh content and I have a lot of that. I just don’t have the time to spill it out here without some serious proof reading. Knocking on doors gives me lots of new insights. For instance I ran across two families along Park (Minnesota) Point whose children attend East High and not Denfeld which includes the Park Point attendance area. This is good evidence of the squeeze being put on western schools. It also reminded me that there were no meetings of the attendance appeals committee which I sit on. This committee hears appeals from families who want to send their children to schools outside their attendance area. Two years ago I only heard appeals from a dozen or so families. This year there were none to hear. I can only presume that our administration decided what the heck. Let everyone send their kids to whatever schools they want western schools be damned. That is a presumption only but if it should be true its an abandonment of western schools. Families that want to escape ought to have to fight to justify their flight. I’ve met only a few folks who narrowed their eyes when I introduced myself. These are folks who have every right to be disgusted with the last year and a half of the School Board. Others raised their eyebrows a bit but otherwise didn’t chastise me. In the harshest cases I always plead guilty. Everyone on the Board, including Art and me, have been part of the dysfunction. I tell people I want to get past it with new colleagues who will be committed to addressing issues like the student attendance at western schools rather than personal feuds or attempts to stifle debate. This week I’ve attended three fairly brief school board meetings. They were fairly sparsely attended by board members. Because of the Columbus/Indigenous People’s Day interruption in the mail none of us had been able to read the agenda items in advance. Still, we soldiered through. Yesterday there was a small item about a $46,000 grant from the Northland Foundation. By coincidence this morning’s Mens Group at our church had the Foundation’s new head, Tony Sertich, as its speaker. Tony was born two years after I first ran for office in 1976. When his turn came to run for office his ascent was little short of meteoric compared to my long stall. I followed his career with interest as I have his fellow Xgener Don Ness. He’s a sharp fellow. Perhaps the thing I thought stood out about him was his saying that, like Don, he had taken a look at national office (read Congress) and decided ten years ago that this was not the life for him. Smart. That reminds me. Stewart Mills is selling off his Fleet Farm business to take up an even more serious run for Congress next year. I don’t expect Congress to reform next year so I can guess what Mr. Mills will find should he succeed in his quest. I, on the other hand, fully expect our School Board to stop imitating Congress after January when a new board is seated. Wish me, wish us, wish Duluth luck on that score. Hmmmm. Put up lawnsigns or write for my blog? I have scads of thoughts to spill out but I’ve decided that Lincolndemocrat’s 450 daily viewers of late pales before the tens of thousands of eyes that pass by lawnsigns on our streets. I did write a 1200 word rough draft post about the visit of the Supreme Court but, I haven’t got time to proof read it. It may never be posted. David Kirby got the nod for the District two seat as he “shines.” It mentioned his ability to work with all sorts of people. Well, he hasn’t called me back to meet me over coffee. Meanwhile Charles Obige seems to shine too but just not as brightly. Charles gladly met me long before I had any intention of helping him. That’s better evidence of an open mind and heart. The Trib endorsed Nora Sandstad. As Loren Martell told me she’s right out of Central Casting. But Loren’s column out-shown every other school board candidate’s and took me by surprise with its simple elegant accuracy. During candidate forums, my opponent in the 3rd District School Board race sincerely has recited a long wish list for Independent School District 709. She says she will lower class sizes, encourage more physical education and art, restore the music program to what it once was, introduce more language classes, bring back seven periods to the high schools and more. I don’t doubt Nora Sandstad’s sincerity. I want the same list she wants. A lot of people do. If it was as easy as just wishing for it, everything on the list already would have happened. What I bring to the table is a creative mind, always rooted in pragmatism. I will wring every bit of good out of the real things I have to work with. For too long, we’ve been led by wishers and dreamers. The entire Red Plan was a wish list with no truth to all its glittery promises. If I had been on the board, the Red Plan contracts never would have been signed. My warnings concerning the long-range facilities plan were valid, but I won’t flaunt all the evidence. I’ll just wonder why anyone would continue following the side that has been so clearly wrong. I will confirm the problem that the dreamer, Nora Sandstad, faces. When I was on the Board in 1997 (I’d get more recent data but the 5-2 majority never wanted me rooting around the District’s old records) we levied $22 million in property taxes. $20 million went to the classroom. $2 million went to paying off old building bonds. Today we only put about $10 million of local property taxes into the classroom not the $20 million of 1997. At $90,000 per teacher, per year that’s a loss of 111 teachers. And some of you wonder why our classrooms are so crowded. Good luck Mrs. Sandstad recovering that money for the classroom. I don’t have to tell regular readers of the Duluth Reader that they have a ringside seat to the School Board when they catch Loren Martell’s reviews of every school board meeting. Now feel free to take what I am about to ask of you with a grain of salt. I have, after all, been censured by our School Board. That was for telling the public that our attorneys warned us how god awful expensive and ugly any attempt to remove Art Johnston would be. If there was anything they hated more than that advice it was me sharing it with the public. So, here’s what I ask of you, Loren Martell’s faithful readers. Tell the readers of that other Duluth Paper, the Duluth News Tribune, what a blessing it would be to have the decent, fair minded, insightful and literate Loren Martell on our school board. Now I suppose you can take Loren with a grain of salt like the Tribune’s editors have. The Chairman of the School Board once had him handcuffed at the public’s podium when he shut the microphone off on Loren. I, however, consider that a mark of honor. It’s not hard to email a letter to the Trib. Just Google “letters to the editor Duluth News Tribune” and send them your 200 words of support for the most knowledgeable candidate running this season. Or, sit back and watch as the folks who tried to remove Art Johnston, censured the two of us and put Loren in handcuffs do their best to perpetuate more of their kind on the Duluth School Board. Nothing snide please! Be “civil” and tell the truth – Loren Martell would be a godsend for Duluth’s dysfunctional school board. Like others in the Duluth school district, Alanna Oswald has noted with growing consternation the number of Duluth students choosing to enroll elsewhere. The potential for an even greater loss of student population as a result of the proposed opening of an Edison high school has been just as worrisome. “The only option is to make our schools better,” Oswald wrote during a campaign season that has seen her grow stronger as a candidate. 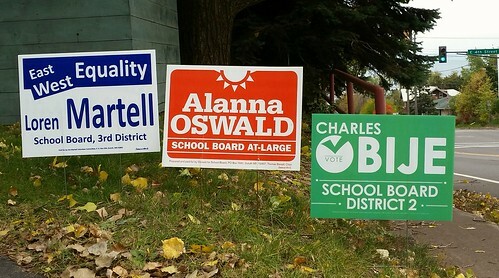 With that commitment, she has become the best choice for voters Nov. 3 in the race for an At Large seat on the Duluth School Board. The editors of the Trib did what I expect them to do. They did the work of good reporters. I’ll humbly add that they made a better case for Alanna in this editorial than I have in a dozen posts in Lincolndemocrat. So, where have I been for the past couple days? I have a post with nothing in it lined up to talk about the persecution of Art Johnston by a gold star teacher. I know what will go there I just haven’t found the time to write it yet. The person who prompted my last post cut me a lot of slack for not polishing up my posts by accepting my excuse that I was too darned busy to fuss about editing so many words. “Fair enough” my critic wrote. But, I have worked harder for the past month trying to smooth out the worst shambles in my writing. too much is at stake for me to lose credibility with new readers unaccustomed to my blithe disregard for well written posts.